The legacy began with the development of a Class-A office building, free-standing restaurant and retail center across from the Civic Center. This distinctive boutique-style office center established a new balance between function, beauty and convenience. Etkin’s first major build-to-suit assignment. The 900,000 sq. ft. master-planned campus that set the standard. Twin office buildings with covered parking and a commanding architectural style. Three stunning office buildings which included the original Compuware headquarters. This highly successful condo conversion is representative of the company’s numerous investments in the Colorado market. 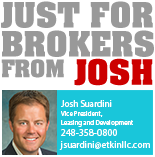 350-acre master-planned business campus located at the epicenter of Oakland County. Another high-profile assignment for a leading financial services provider. The first of three hotels to serve the needs of Oakland County’s largest mixed-use development. Build-to-suit building on the edge of Etkin’s Timberland Office Campus. A full-service hotel and conference center designed to business-class standards. This 50-acre mixed-use campus was developed adjacent to Schoolcraft College. Etkin has developed a significant Marriott brand hotel portfolio. Etkin continues to be a trusted resource for leading global companies. Class-A build-to-suit regional headquarters building developed in cooperation with the Detroit Lions, Inc. This stunning building at College Park overlooks I-275, a reflecting pond and nature preserve. This hotel continues to enjoy exceptional high demand from business and leisure travelers. One of the nation’s leading market research firms engaged Etkin to build its new Livonia office headquarters. A leading physician group with a 50-year history retained Etkin to manage its new state-of-the-art facility. Nearly 30 years ago, Etkin created one of the first boutique-style luxury office buildings in Michigan. Today, the building has been restyled with sophisticated new finishes to continue the tradition of Etkin Excellence. Etkin collaborated with Beztak Properties to develop All Seasons Birmingham, which offers 131 luxury senior living residences within walking distance to the community’s shopping, dining and entertainment district. The rich legacy of Etkin weaves together many stories, all with a common theme….developing and acquiring high-quality properties that have reshaped and enhanced Michigan’s landscape. These are exceptional places where each day thousands of people work, shop, stay and spend their leisure time. Each milestone reveals the passions of innovative people, the imagination behind groundbreaking development strategies and the unwavering quality that is the hallmark of the Etkin brand. Travel through time with us to explore how Etkin has grown over the decades.